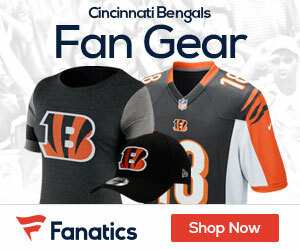 « Bengals Official Site Says Team Still Talking to T.J. I envision the Bengals’ headquarters, where shrewd maneuvering and important decisions are made, built secretly into a mountain side like that of Cobra Commander’s hideout. Here Mike Brown consults with Destro and Mr. Commander himself, on ways to rule more tyrannically. “I’m losing my touch,” he admits to the others. They laugh at him in those exaggerated cartoon voices. He sulks and resigns Darryl Blackstock. I thought signing Blackstock last season was worth a try, but throughout the season, the only notable achievement he managed to produce was a four-game suspension for banned substances. He’s big (255-260) and he looks kind of scary with his black visor, but we don’t need to add dead weight on guys trying to salvage a career. I would have rather brought back Corey Mays than have Blackstock return. We know Mays can play special teams well; what does Blackstock do well? Tendering Brandon Johnson makes much more sense and is a solid move. Here’s a player who played in 16 games and had over 80 tackles last year. He’s tall (6’5’’), and he’s one of the few Bengal linebackers in the Marvin Era who plays well in coverage. This is the kind of player you resign to add depth at a position. He’s proven his value, and $1.55 million is a steal to bring him back. The same case could be made for tendering Jeanty: a player with a lot of experience, racked up 99 tackles and comes at the same bargain price. The difference, however, is that Jeanty doesn’t cover well and doesn’t produce a consistent pass-rush – zero career sacks. He can tackle well, but he has trouble getting to the corner fast enough on outside running plays and screens. I don’t have issue with him returning at the restricted free-agent price for this season, but I wouldn’t want him long-term. The deal I’m most pleased about so far, has been the resigning of the jitter-bug, DeDe Dorsey. It’s refreshing to see how Marvin Lewis acknowledges DeDe’s explosive play-making ability, despite his issues with fumbling and staying healthy. Dorsey can break away for a score any time he touches the ball and is squirmy enough to break tackles. Screen-plays to the little fireball can be useful in the all too familiar, third-and-long scenario. Providing Carson with a variety of weapons will be the only way this offense can excel; DeDe is one more piece to that arsenal. Perhaps Mike Brown is losing his touch. If resigning Blackstock is the only real complaint (outside of the franchise-tagging of Shane Graham) so far in this free-agency, then we’re already doing better than most years. More sensible moves like this and Mike Brown may be expelled from the super-villain lair – temporarily, of course. Mojokong – sometimes it’s better to enjoy the things you already have.